Th Santa Fe Conservation Trust began creating a Conservation Plan for its region in 2010 in direct response to the 2009 Strategic Plan. 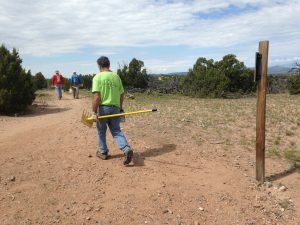 An ongoing process the Plan is updated and enhanced as we work to protect the land of Northern New Mexico. A key component in the planning process is Geographic Information Systems (GIS). GIS is a computer-based system that captures, stores, analyzes, and manages data linked to a geographic location. GIS is a powerful planning tool SFCT employs to create interactive queries, view and analyze spatial information, edit data, create maps and present the results of these operations. Through our conservation planning efforts, SFCT is identifying Priority Focal Areas that represent landscapes where conservation opportunity and investment is greatest and where strategic conservation projects are at great need.